Didymus the Blind (AD 313 – 398) was an important Christian exegete from Alexandria. He was esteemed by Jerome and by Bishop Athanasius, who appointed Didymus head of the school at Alexandria. Blind already in his youth , Didymus was heavily influenced by Origen (ca. 184 – 254) and composed numerous volumes of biblical commentary. When the writings of Origen were condemned as heretical by Justinian at the second council of Constantinople (553), Didymus’s writings also fell into disrepute. During the Middle Ages, no copies of Didymus’s writings seem to have circulated. “P.BYU Did.” identifies part of a late-5th/early-6th century papyrus codex that was scattered after its discovery during the Second World War and is now partially recovered in various locations. In 1941 British military engineers discovered a hoard of at least eight papyrus codices in a subterranean cavern at Tura, about 10 miles outside Cairo, almost certainly in the very spot they had occupied since Late Antiquity. The Tura find restored otherwise unattested treatises by Didymus the Blind, by Origen, and by another unknown author. Five of the Tura codices contain Didymus’s commentaries on principal books of the Old Testament, Genesis, Ecclesiastes, Job, Zachariah, and Psalms. The Commentary on the Psalms filled Tura Codex V; and it seems likely that more than one codex would have been needed to hold the entirety of Didymus’s treatise on Psalms. Like the other Tura codices, the Psalms Commentary was dismantled and scattered almost immediately after its discovery. Within weeks many pages were recovered by the Cairo Archaeological Museum. Portions of the codex are in Geneva and London. The University of Cologne archives 182 of the 288 pages — 12 of at least 18 signatures — that originally comprised the Tura Psalms codex. Finally, a portion of the codex is at Brigham Young University, in Provo, Utah. Since surviving signatures cover only the portions of the Commentary between Ps. 20 and Ps. 44, it seems reasonable to suppose a separate codex or more must have held Didymus’s work on the Psalms outside the range covered in Codex V, i.e. Ps. 1-19 and 44 ff. P.BYU Did. comprises two discreet portions of the Tura Codex V: 1) the entirety of the codex’s eighth signature, a “quinion” — 5 papyrus sheets folded to make 10 leaves or 20 book pages (folio 10verso-01recto, 02verso-09recto, etc.) — which covers Didymus’s commentary for Psalms 26:10 – 29:1; and 2) half of the first sheet (bifolium) belonging to the sixteenth gathering (i.e. 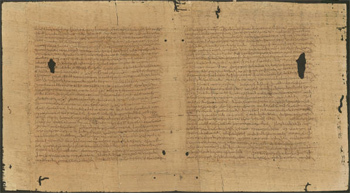 01recto and 01 verso only), with Psalms 35:13f. The rest of the sixteenth gathering of Codex V is still at large. The text written is dated by paleographical means to the late 5th-Century or early 6th-Century, at least a century after Didymus’s death. The strokes of the clean literary hand are written with the characteristic iron-gall ink of the times and applied to sheets of papyrus, some of which was once written on with another text. This later, more visible, text is called a palimpsest (fr Greek: “scraped again”), a type of textual artifact commonly found in medieval codices but more rare in papyrus texts. Palimpsests typically manifest a second use of writing material that rejects a less valued document in favor of one that is more highly esteemed. In a few places the earlier text is slightly visible and especially enhanced by infrared light. The extent of the older text throughout P.BYU Did. and, indeed, throughout other remnants of Tura Codex V is a matter of ongoing scholarly investigation. Current readings reveal an otherwise unknown text suggesting that the older text contains documentary records of the Tura monastery. A complete scholarly edition with translation of P.BYU Did. is forthcoming from BYU scholars D.W. Graham and J. Siebach. The decipherment of the earlier palimpsest text is being conducted by BYU’s Ancient Textual Imaging Group. BYU undergraduate David M. Nielsen’s background brief on the history of the Didymus Papyrus was sponsored by a scholarship from The Friends of the Harold B. Lee Library. 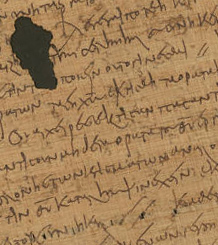 Additionally, a brief description of the papyrus has been published in: Brent Harker, “Didymos the Blind Sees the Light of Day,” BYU Today (June 1985), p. 19–20.